indexcardrecipes | recipes on a 3×5. brought a thing of leftover roasted garlic (a head of garlic roasted whole until the cloves are soft and mashable) which was mixed into salted butter with some cayenne pepper. also had end pieces of bread. toasted the bread in the toaster at work, and made myself make-shift garlic bread. I had brought some cooked orzo to the office, and thought I’d do something similar to what I had done for OC#2. I added pesto, shallot, and frozen corn, as well as a tomato (that I was somehow able to dice up in a bowl). unfortunately, I forgot about all the added water from the frozen corn and tomato. next time, I should warm them up first and then drain the extra water. otherwise … pretty good. I scrambled this morning to figure out what to do for lunch. I knew that I had some couscous leftover at work, but it wasn’t enough for a full meal. I did, however, have some pastina that I figured could work just like couscous. I also eyed the frozen veg when I tried to find a frozen meal in the freezer (apparently I have none left), and found a jar of cilantro pesto that I had made. at work, I combined the couscous and pastina, added hot water, microwaved it for 1.5 minutes, and let it stand. I realized I also had shallot in the fridge, and added that along with the thawed corn and pesto and warmed it up again. added a bit more S+P, and I am now one happy camper. found a ziploc bag full of cooked mussels with broth in the take-home fridge. odd, but … awesome. took the leftover broth, warmed it up, and then threw in some couscous that I keep on my cubicle’s shelf. I’d like to think that my idea was genius. and I’m talking about kitchen toys, here. lots of things I don’t need. lots of things I bought because of some dish I wanted to make, but never got around to doing. or things that I’ve indeed used, but not nearly as much as I would like. hope all you kiddos had a good holiday season! mine has been a bit tough for various reasons, but also quite amazing because of all the wonderful people with whom I’m surrounded. i’m super grateful for the genuine and caring people at my day job, i feel completely at ease (with my quirkiness) with the people at my side gig, there are so many wonderful women i get to call both old friends and new, and i get to have my brother and my sister-in-law around for Christmas before they move back to the west coast next month. so as i just mentioned, i spent Christmas at my brother and sister-in-law’s place. i spent most of the day helping them pack, so thankfully i had time the day before to prepare a dessert as my contribution to our Christmas dinner with a few friends. 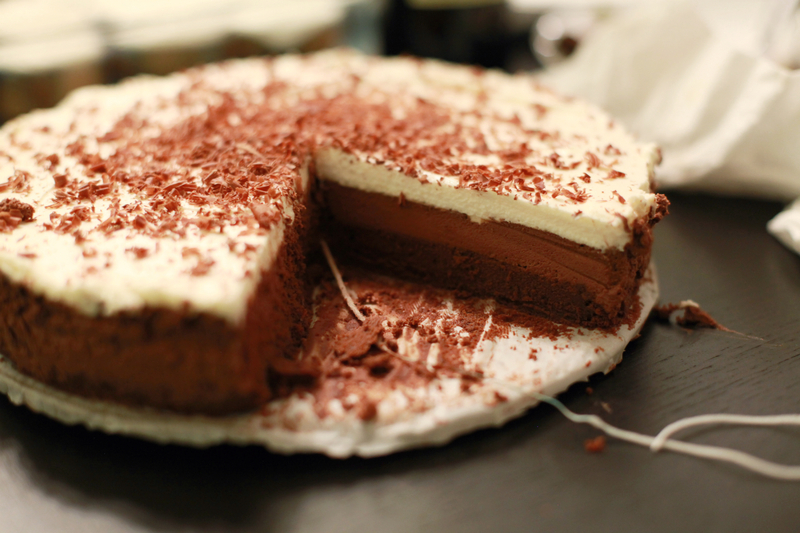 the cake i decided on is the Triple-Chocolate Mousse Cake from CooksIllustrated.com because that photo is just soooo so so enticing. (that, and the Maple Walnut Cake from the sister-site CooksCountry.com requires maple extract, which was relatively hard to find.) even better, it’s perfect for making ahead of time since you can keep it in the fridge, and it needs to sit in room temperature before serving for 45min (which can be done while you’re eating the main meal … or digesting from the main meal). it was too complicated to write on a single index card. 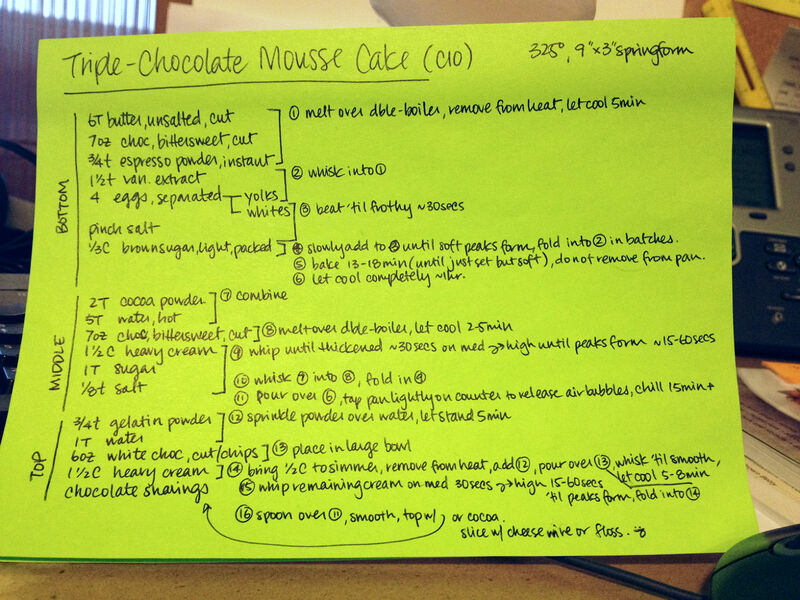 as mentioned on my “about” page, i rely on giant Post-It notes for more complicated recipes from time to time. you really want a stand mixer or hand blender for this (unless you’re good at whipping up cream by hand … which I’m proud to say I am). my immersion blender with whisk attachment didn’t always work. i realized that Cooks Illustrated has a method of folding one batch of something into another by folding 1/3 of ___ into ___ with a whisk before mixing the rest in with a spatula. i didn’t write this detail in my instructions. yes, that’s the floss I used to cut the cake. believe me, it works much better than a knife! it’s a gorgeous cake, but not without effort …. if you attempt this, good luck! I’ve been waiting a while to make this. 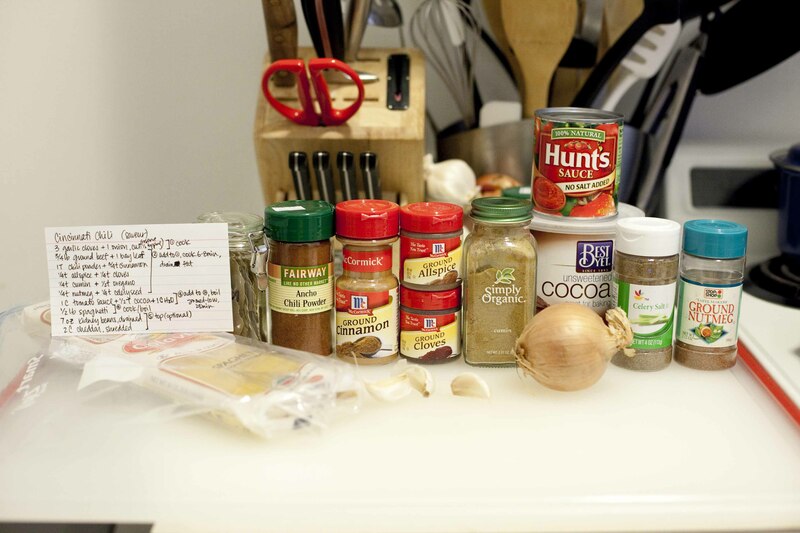 I’ve eaten it only once before, really, so I’m not the best person to ask for an opinion on “the best Cincinnati chili recipe/restaurant.” all I know is that I had it once at a place called Real Chili in Milwaukee, WI, and I’ve been having cravings like mad ever since. I laid out everything (but the beef) before I left for a week back home in California so that I could get cooking more quickly when I got back … eager beaver, I was. now, I didn’t have everything listed on the index card (namely, oregano), but I was too eager to wait when I got back home, so … onward I went! cheddar-wise, I had only some dairy free cheddar sitting in the freezer. I had heard about daiya somewhere online, and grabbed some in case I had lactose-intolerant guests. 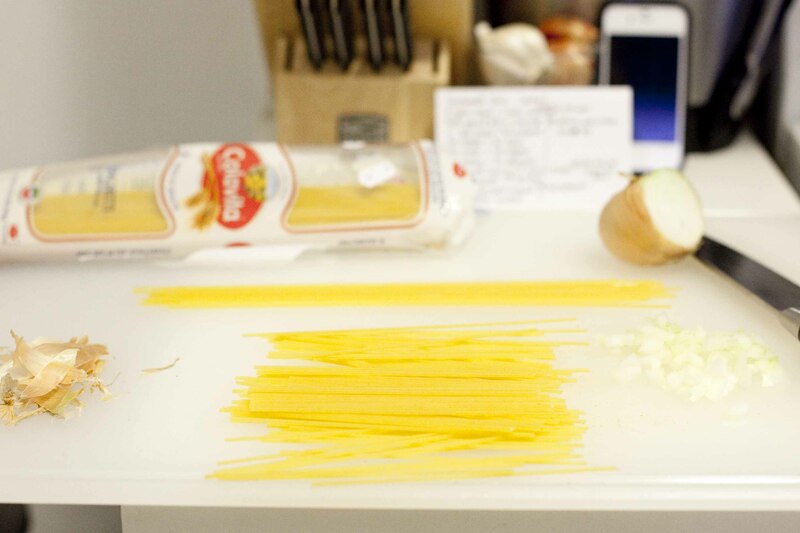 I also cracked the spaghetti in half, since I saw the guys doing it back in Real Chili. it’s so much easier to cook in a small pot (especially since I was cooking for just myself), and MUCH easier to eat than if left full-length! 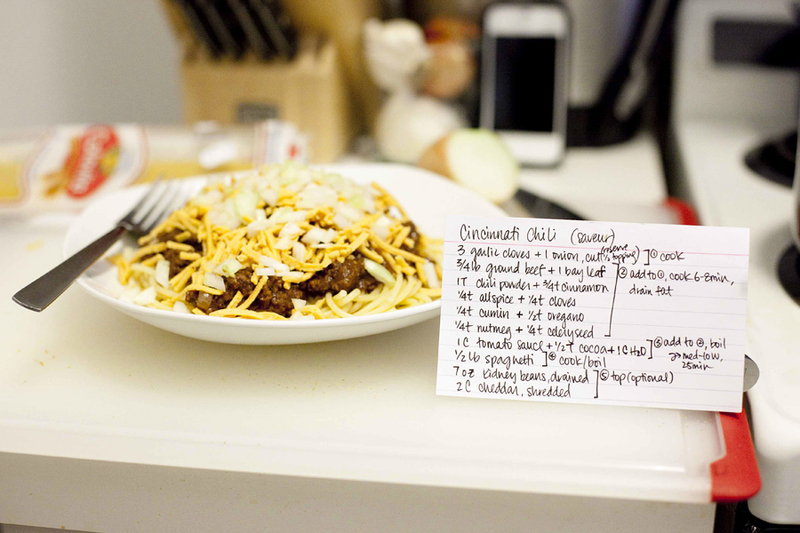 this is the final dish … Cincinnatti chili 4-ways: half-cracked spaghetti topped with chili sauce, fake cheddar, and chopped onion. (I LOVE raw onion.) 5-ways would have beans on top, but I didn’t feel like it. 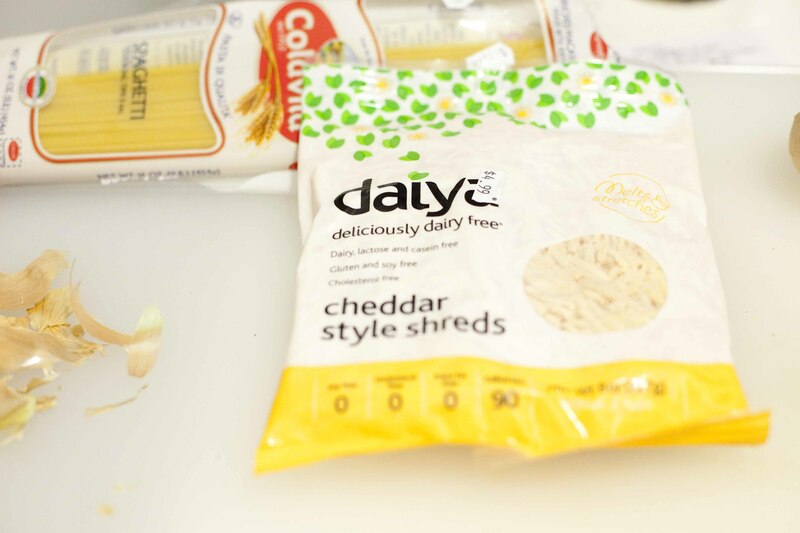 I could do without the daiya fake cheese, but the rest of it? it tamed the craving. for the moment.